Pakistan skipper Sarfraz Ahmed apologised for the racist comments he made against Andile Phelukwayo during the 2nd ODI against South Africa. 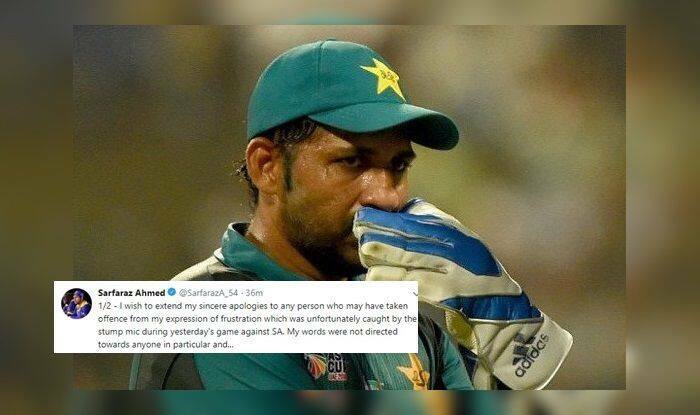 Pakistan skipper Sarfraz Ahmed apologised for the racist comments he made against Andile Phelukwayo during the 2nd ODI against South Africa. From behind the stumps, the Pakistan skipper was heard referring to Andile Phehlukwayo as ‘Kaale’ (meaning black). “Abey kaale, teri ammi aaj kahaan baitheen hain? Kya parwa ke aaye hai aaj?” Sarfaraz Ahmed was caught saying as he came near the stumps to collect a ball. (Translates to: “Hey black guy, where’s your mother sitting today? What [prayer] have you got her to say for you today?”). Meanwhile, South Africa won the match by five wickets as Phelukwayo bagged the Man of the match for his splendid show with the ball and the bat. He picked up a four-wicket haul apart from scoring 65* runs.